Pricing Includes :	a one-color silk-screened imprint up to five lines of copy. 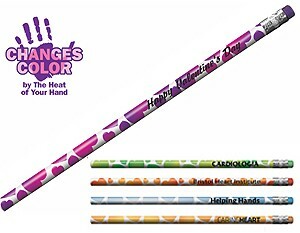 Change Ink :	$25.00 (G) per change. Must be at least 1/2 the lowest quantity offered. Less Than Minimum :	$20(G) Absolute minimum is one-half of the lowest catalog quantity. Copy Change :	$25.00 (G) per change. Must be at least 1/2 of the lowest quantity offered. Shipping Weight :	13 lbs./M. Packaging :	250 per box, unless 144 specified. 12 pack cardboard band available (4-1/2" long), add $20.00/M (G) or less. Pencil Sharpening :	$20.00/M (G) or less. May cause lead dust in carton. Please note we cannot offer a 24 hour rush if the pencils are being sharpened.